A 14-year-old Turkish middle school student was crowned the winner at the Jan Vychytil International Cello Competition that was held for the 13th time in Prague this year, reports said Tuesday. Nehir Nisa Alemdar, a scholarship student at Bilkent University's music school for elementary and middle school students, came in first place in the third category of the competition with her outstanding violoncello performance. 160 young musicians from different countries, including Poland, Russia, Italy, the Czech Republic, Germany, China, Belarus, Ukraine and Mongolia, competed at the competition that was held between Jan. 7 and 20. 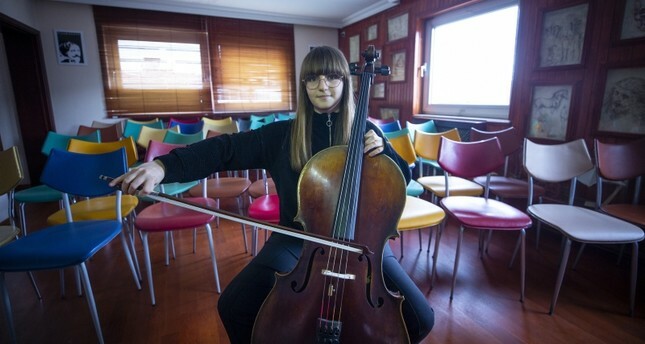 Alemdar, who took lessons from world famous cellists Jens Peter Maintz and Pablo Ferrandez, told Anadolu Agency that she practices on the cello for five hours every day. Speaking about her interest in music, Alemdar said that since her parents are music teachers, there have always been musical instruments at home, including a piano, and she started to become interested in those instruments when she was just 3 years old. "Every time I looked at the piano keys, I felt like I was in a movie and was immediately excited. Then I met other musical instruments," she said. Underlining that music brings happiness, excitement and a bit of stress, Alemdar said "this stress is what makes you live a more beautiful life." She also said she is thinking about being involved in other types of art as well, such as dancing or acting. Alemdar's father Kubilay Alemdar said that her daughter's interest in music and musical instruments began at a very young age, and even though she was not receiving any education at the time "she started to figure out (the notes,) the melodies of songs by herself by playing with the keys of the piano."